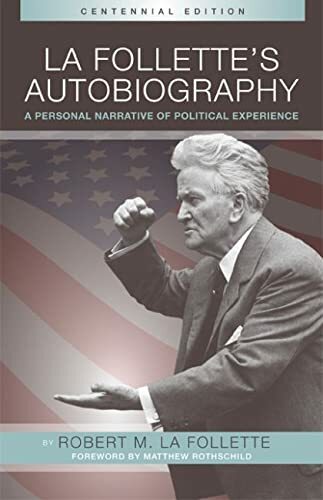 "Focusing on the intense personal relationships that bound the state's first family together in the pursuit of the public good, Weisberger's account breaks fresh ground in its analysis of the origins and development of Wisconsin Progressivism and enhances our understanding of Midwestern insurgency." --James J. Lorence, "Journal of American History"
"A political testament of great worth. . . . It was, and remains, a testimonial to democracy by one of its great champions." John C. Colson, Wisconsin Historical Society"
"Direct, sarcastic, savage, jutting his powerful jaw at its most defiant angle, banging home his points until his fist sometimes trickled blood, 'Fighting Bob' was something to behold. The essential qualities of the man are all in this blunt, belligerent, rousing autobiography." Eric F. Goldman, New York Times Book Review"